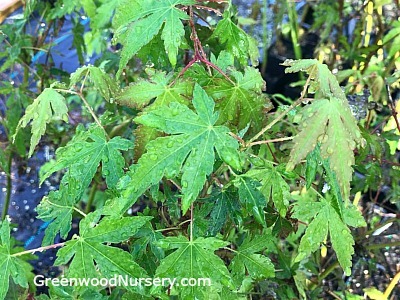 This delicate green leaved Japanese Maple is an excellent choice as a small growing tree for yards with limited space. Beautiful color and texture as a small foundation tree in dappled shade, zen gardens and container gardens. Prefers high acidic soil. Green Japanese Maple is grown in quart pots. Orders shipping to CA or AZ addresses will be bare rooted and root washed before being prepped for shipping.